At the San Francisco Botanical Garden, you can see plants that look they came right out of Jurassic Park and flowers that look like white doves, or you can sniff your way through an entire garden of species chosen just for their amazing scents. And that's just for starters. The San Francisco Botanical Garden covers 55 acres, which is larger than 40 football fields. Those acres are filled with more than 8,500 varieties of plants from around the world. The best part about the San Francisco Botanical Garden is that they always have something unusual growing or blooming. In February, don't miss the showy, deciduous magnolia trees, which fill their bare branches with white and pink blossoms that can have as many as 36 petals each. In early spring, it's hard to ignore the primeval-looking plants at the edge of the Ancient Garden. Technically named Gunnera tinctoria, it's also called Chilean rhubarb or Dinosaur food, a name that's appropriate for a plant of its prehistoric appearance. Gardeners trim the plants to the ground every winter, but they grow back at a head-spinning rate, reaching four feet tall in just a few months and producing a stalk in the center bearing exotic male and female flowers. If you go in May, you might catch the dove tree in bloom. The part that is technically the flower is tiny, but they are surrounded by white, wing-shaped bracts that can reach six to seven inches long. Some people say the resemble doves. September is a good time to see the spectacular Angel's Trumpet in bloom, with dramatic pendulous, fragrant flowers in a variety of colors. You'll find some of their thousands of plants doing something interesting no matter when you go. You can find out the current bloomers at the San Francisco Botanical Garden website. If you are planning a marriage proposal at the Botanical Garden, the fragrance garden is a good spot. Or scout the garden ahead of time to find a secluded spot among the plants to pop that big question. Just in case you're wondering what happened to the arboretum at Golden Gate Park, it's now the San Francisco Botanical Garden at Strybing Arboretum. Admission is charged for anyone over four years old. Members and San Francisco city residents get in free. So does everyone else on a few selected days a year which are listed on the website. If you're visiting in a wheelchair, most of the Garden's pathways are accessible and marked on wayfinding signage with the ISA symbol. Complimentary wheelchairs are also available at both Garden entrances on a first come, first served basis. Strollers are also allowed, but no other wheeled vehicles. If you're a gardener who may want to take some of their gorgeous plants home with you, plan your visit during one of their monthly plant sales or their annual sale, which is not only Northern California's largest plant sale but features many one-of-a-kind specimens. You can find the sale dates on their website. You can visit the Botanical Garden when you go to Golden Gate Park. It's on the east end of the park, near the California Academy of Sciences, the de Young Museum, and Japanese Tea Garden. You can also see more plants and flowers in the Conservatory of Flowers and the park's outdoor flower gardens which include a dahlia garden, tulip garden, and rose garden. If you drive to San Francisco Botanical Garden, you can find directions on their website. Street parking is available near both entrances, but it fills up on weekends and holidays. 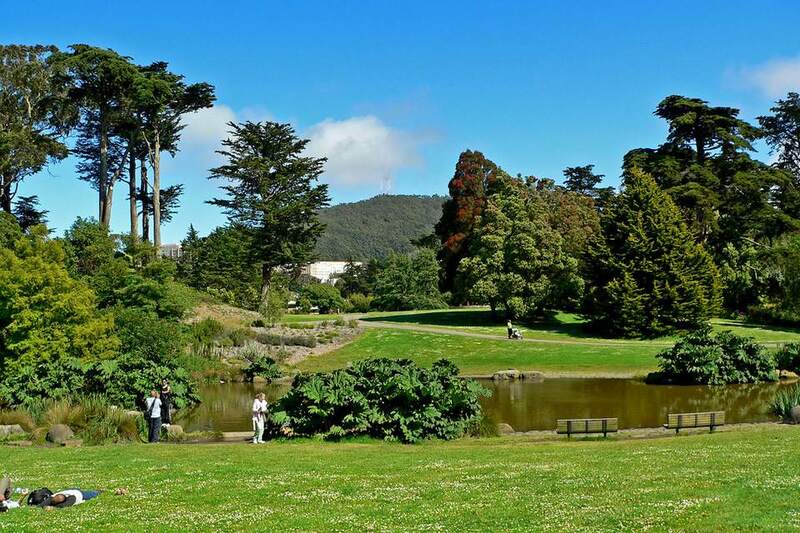 On Saturdays, Sundays and major holidays, you can park somewhere else in the park and take the Golden Gate Park shuttle—or anytime, you can get there by public transportation. If you arrive by bicycle, you'll find bike racks at both entrances.